Included below are condos for sale in Downtown San Diego. If you would like more information on any of these Downtown San Diego condominium listings, just click the "Request More Information" button when viewing the details of that property. We can provide you with disclosures, past sales history, dates and prices of homes recently sold nearby, and more. And, if you haven't already, be sure to register for a free account so that you can receive email alerts whenever new Downtown San Diego condo listings come on the market. When searching for Downtown San Diego condos for sale you will find San Diego’s streets are laid out in a grid, making it easy to navigate unfamiliar parts of the downtown area. Commuting to work with the San Diego Metropolitan Transit System and the San Diego Trolley offer easy service in downtown San Diego. The Coaster – a commuter train that runs from the northern suburbs into the heart of Downtown San Diego – is another popular way to get to work. San Diego is the 8th largest city in the United States, but for a city its size, Downtown San Diego has a surprisingly low crime rate. In fact, San Diego’s crime rate is lower than that of the state as a whole, and the state of California has a lower crime rate than the national average. The Gaslamp Quarter covers 16.5 blocks of Downtown San Diego and is on the National Register of Historic Places. This quarter is filled with Victorian era buildings that are still in use today. These buildings are home to a number of shops, restaurants, and nightclubs. Gaslamp Quarter is best known for its entertainment venues, festivals, and other community events. Some of the most famous events in this area are Mardi Gras in the Gaslamp and a Taste of Gaslamp. This area is also the site of a popular St. Patrick’s Day celebration: ShamROCK. One of the benefits of living in Downtown San Diego is that you will be surrounding by music and art. The Civic Theatre in the Community Concourse hosts a variety of performers. Most notably, it is home to the San Diego Opera, but it also facilitates performances by traveling acts. The nearby Copley Symphony Hall was built in 1929. At this time, it was the Fox Theater, but it has since been renovated to provide a home base for the San Diego Symphony. Another popular theater in Downtown San Diego is the Spreckels Theater. It has been in operation since 1912 and as such, it has been added to the National Register of Historic Places. Both local and traveling shows have been hosted at the Spreckles Theater throughout its history. Downtown San Diego 92101 has six neighborhoods including Little Italy, Gaslamp, Marina District, Cortez Hill, Columbia District, Waterfront District, and East Village Ballpark District. Downtown San Diego’s Columbia neighborhood is a popular spot for tourists and locals. It is home to the Midway aircraft carrier museum ship as well as several other preserved ships at the San Diego Maritime Museum, including the famous Star of India, an iron-hulled merchant ship that is one of the oldest vessels that is still seaworthy. As such, it has been designated a California Historical Landmark as well as a United States National Historic Landmark. Among other things, this museum helps to chronicle the area’s long involvement in the United States Navy. If you are thinking about moving to Downtown San Diego, you will be happy to know that many of the area’s utilities do not operate under a monopoly. In fact, you will be able to choose from several San Diego utility companies for trash, cable and satellite. Having a variety of options will let you select the services that are most important to you while choosing to avoid paying for extra channels that you are not interested in. The San Diego Gas and Electric Company oversee San Diego’s gas and electric, while the community’s water is distributed by San Diego’s public utilities department, streamlining the dispersion of these vital resources. 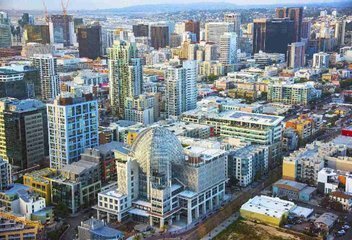 New residents of the Downtown San Diego real estate will be happy to hear that the area is served by an assortment of schools, including public schools that are overseen by the San Diego City Schools and several private and religious schools.